Schooldays at St Clare's are never dull for twins Pat and Isabel O'Sullivan and their friends. The twins have decided to study hard and stay out of trouble this term. But they just can't help themselves - poor Mam'zelle had better watch out for their tricks. There's mischief at St Clare's! How many weeks are in a school term, how many weeks do you spend at school in a year? Even though the twins have decided to stay out of trouble they just can’t help themselves. 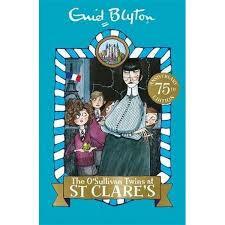 There’s lots of mischief from the author of the Famous Five books. In the book Miss Lewis takes the whole class on the school bus – how m any children fit on a bus? How many buses would you need to transport your whole school to a school picnic?